Orlando Chamber Choir is always interested in hearing (from) enthusiastic new members - although there are no immediate vacancies at the moment. All you need is a good voice that blends with the current group of singers, and the willingness to commit to weekly rehearsals - we are not a project choir. Good sight reading is essential. Orlando Chamber Choir mainly performs Renaissance and baroque works so an interest in "old music" is helpful, too. The choir prepares four concert programmes each year - a large-scale autumn concert in November, a Christmas concert and performances in March and in June. Usual concert terms consists of ten evening rehearsals, an all-day Saturday rehearsal and an afternoon dress rehearsal on the concert day. The evening rehearsals take place on Thursdays from 19:00 to 21:30 at St Mary Abchurch [ map ]. Choir contributions are £75 per term, with student rates available on request. Orlando Chamber Choir is not just a group of ambitious singers but also a friendly bunch. After rehearsals we usually round off the evening at The Sir John Hawkshaw [ map ]	in Cannon Street Station. If you want to become a member of Orlando Chamber Choir you will need to join us from the first or second rehearsal of the term so that we can arrange your audition by the third week at the latest. Please contact us	if you are interested. Auditions typically include exercises testing intonation, voice range and sight reading. 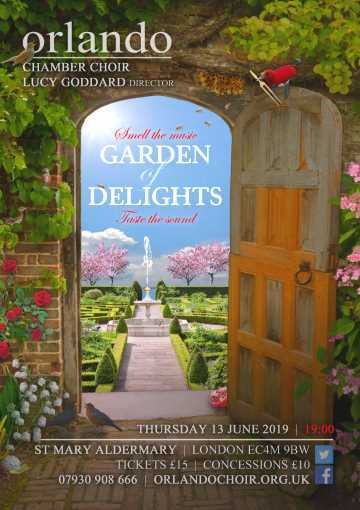 Aspiring members will also be asked to prepare a short solo piece which our music director Lucy Goddard	will be happy to accompany on the piano. Please do not hesitate to get in touch if you require further information!